The Pro leather gloves are perfect for those jobs that are especially hard on the hands. When anything less than a leather glove won't do. 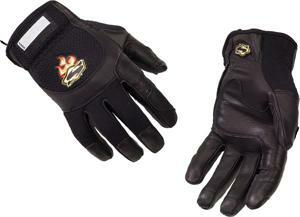 Top quality leather construction with breathable mesh on top of hand and fingers. Leather knuckle panel provides increased protection. Easy entry, wide opening elastic cuff (Easy-Fit design). Anatomically-cut, leather palm and heel reinforced panels for extended durability. Smooth surface thrumb improves handling of objects. Reinforced thumb and fingertips increase protection and reduce wear.